St. Andrew's longest-serving rector Rev. Neil Stanley (1920-1942) is pictured talking to someone in the back row. Associate priests in the front row appear to be Rev. John Hudston (1924-1937) on the right and either Rev. Ralph Rohr (1927-1929) or Rev. W.L. Hogg (1926-1932) on the left. 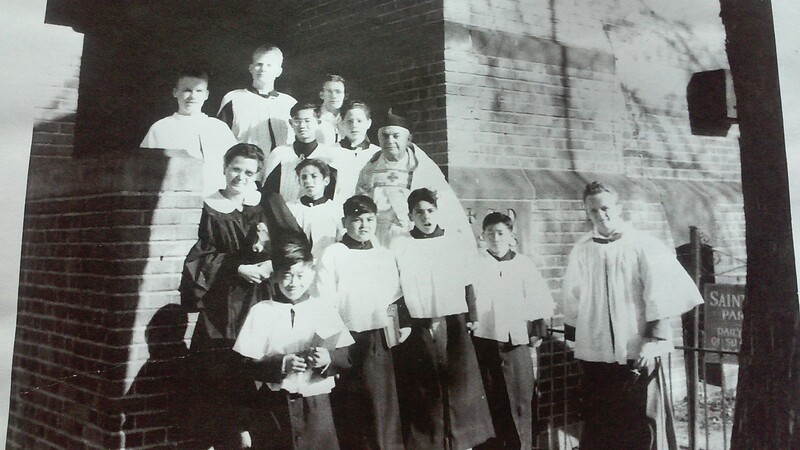 Rector Charles Evans (far right – second row) & Organist Delphine Schmitt (far left – second row) gather with choir boys & acolytes ca. 1942-1948 at entrance to St. Andrew’s Episcopal church. In 1874, when Colorado was still a territory, St. Andrew’s Episcopal Church became the second Episcopal Church in Denver. Located at 26th and Curtis, it was named Trinity Memorial Chapel. In 1909 the parish moved into its current location at 20th and Glenarm after commissioning Ralph Adams Cram to design its modified Gothic brick building. By post-World War I years, the name was changed to St. Andrew’s Episcopal Church. 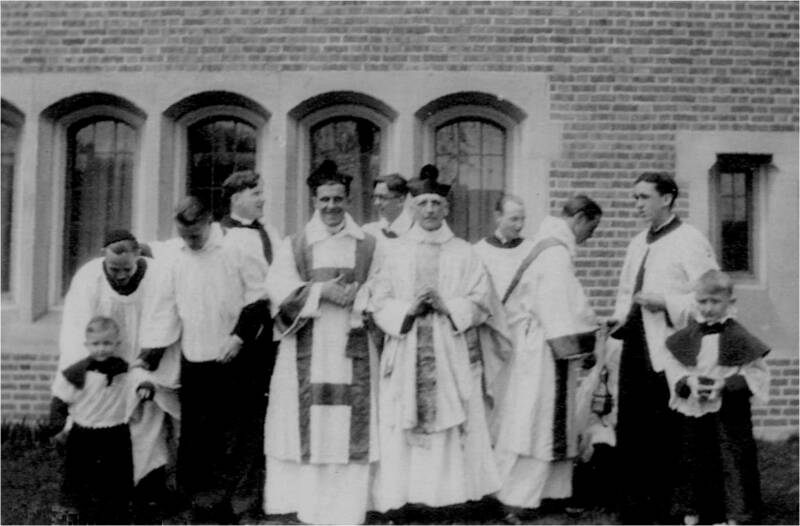 For over 90 years the parish has been distinguished by its Anglo-Catholic liturgy. In addition, the parish maintains a long history of diverse outreach within Denver’s inner city. In modern times, St. Andrew’s Episcopal Church has become synonymous with musical excellence expressed in its liturgy and the Denver community. 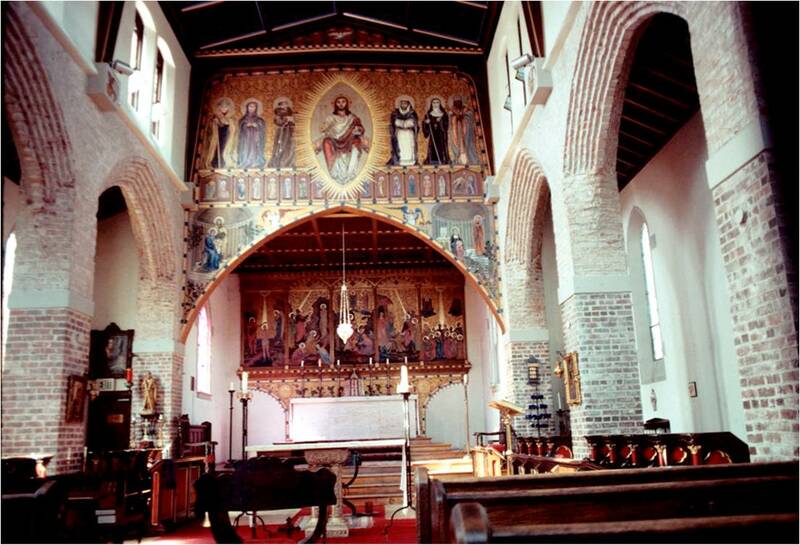 It is home to the St. Martin’s Chamber Choir and numerous musicians within its pews. During Fr. Jon Marr Stark's era (1969-1984) an elaborate mural "The Majestras" was painted above the chancel by Brother Francis of the Order of the Holy Family. The focus of the mural is Christ in glory surrounded by numerous saints and Biblical events. The Order was founded by Fr. Jon (also named Abbot Jon Aidan) and the parish was known as St. Andrew's Abbey.